From a receiver to donor. I live in Vanamangalam village in Tamil Nadu’s Krishnagiri district. I’ve always been a farmer who loved farming, but my land yielded little. All that changed after SST’s social workers visited the village and used horticulturists to train us farmers in mulching. Like other farmers, I had my doubts. I decided to put mulching to the test by growing capsicums on a small plot. I began by creating 3-feet wide beds and filling them with soil enriched with manure and nutrients. Then we laid pipes under the beds for irrigation. We then covered this with a polythene mulching sheet with holes to retain moisture and prevent seepage. I peppered the vegetable beds with 1,000 seedlings, and waited. Fifty days after planting my first harvest yielded 500 kilos per day, for the next six weeks. The three-month crop fetched me Rs. 375,000. Encouraged by this, I used the same mulching sheet up to three times for different crops. My success has motivated five farmers to adopt mulching. My life has changed as the increased income has helped me build a house and pay for my son’s education in an engineering college. More importantly, I have enough money now to give back to the community. I donated Rs. 10,000 for the renovation of the village primary school, to buy stationery for students and to contribute funds for the development of roads in my village. I feel I can make a difference in the lives of others because my own life has improved much. SST social worker Nanjappa who mentored Jaipal Reddy. Jaipal Reddy’s wife was a member of the village women self-help group, so in some ways she was the starting point. 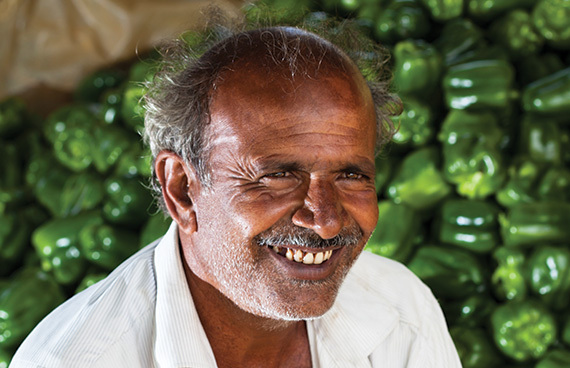 Jaipal had studied only up to seventh standard, but was very keen on knowing more about new methods of farming. His extended family owned 8 acres of land, of which he had access to half. We began by getting him to interact with experts from the agriculture and horticulture departments. He was told about vermi-compost, mulching and so on. He began by putting mulching sheets on one acre of land, then increased it to three acres and then to five acres. All this started three years back. Ram Reddy, an agriculture expert with about 30 years experience, was called in to help. He had introduced better farming practices in a host of neighbouring villages. Not surprisingly, Jaipal and other farmers were impressed. While previously only a few acres of land was under the mulching method, this has shot up to almost 40 acres. Now there are 98 greenhouses in five villages. Today, 25 families have adopted the mulching method. Abhilash, a trained teacher with a B. Ed degree, has also decided to go in for this method of farming and has four greenhouses. In January, in a single day, he recorded sales of over a lakh rupees, selling roses. Recently, he began growing capsicum, while Jaipal Reddy has introduced marigold, carrots and tomatoes. I am really pleased with what Jaipal Reddy has achieved. His eldest son Manjunath, 27, has studied B. Pharm and earns Rs. 45,000 a month. His second son has completed a degree in Electrical Engineering. Today, 64 members in the village hold multiple degrees, while a decade back this number stood at eight. As social workers, we can only try to spread awareness. We can get experts from the agriculture department to help in soil testing, drip irrigation, vermi-compost and so on. In the end, villagers themselves must decide to make use of this knowledge and adopt these practices for their benefit. It is also gratifying to see people such as Jaipal Reddy becoming an inspiration. He and his family are now a moving force in the village. They stand for change. Copyright 2018 TVS SST. All Rights Reserved.